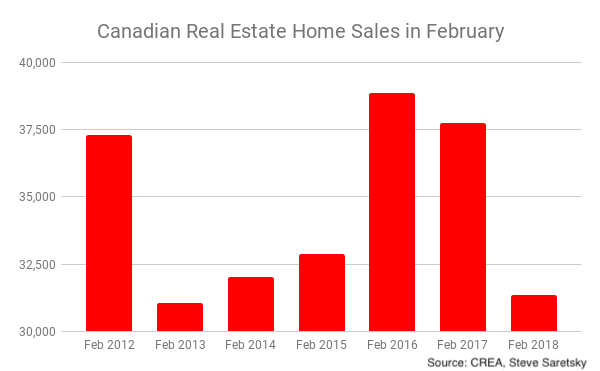 In recent months Canada’s financial regulators have taken a concerted effort to cool the great Canadian housing boom and slow the pace of record high household indebtedness. 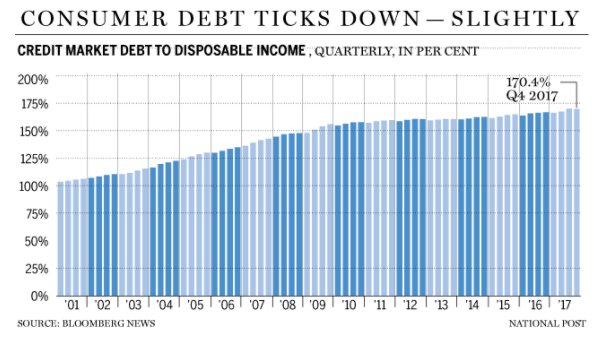 There appears to be a strong desire to shift away from a Canadian economy over dependant on household borrowing. Recent policies aimed at curbing mortgage credit growth, known as the B-20 mortgage guidelines, have been lauded as the most stringent mortgage changes in recent history. The clamp down which comes fully loaded with three Bank of Canada interest rate hikes in less than a year, appears to be working. National home sales fell 17% year over year in February. Hitting their lowest total for the month of February in the past five years. According the Canadian Real Estate Association price growth has also decelerated for ten consecutive months. Household debt to income also edged down in the fourth quarter of 2017 from 170.5% to 170.4%, while Household credit growth decelerated for three consecutive months, turning negative in January, the first time in over six years. “While it’s too early to tell, we just might have seen the peak in the debt ratio in Q3, as Q1 will no doubt see a sizeable decline due to seasonality,” said Benjamin Reitzes, Canadian rates and macro strategist at the Bank of Montreal. Instead, the burden will shift towards the public sector with Canadian provincial and federal governments projected to run a cumulative deficit of $31.9 billion in 2017-18. Despite this, Governor Poloz remains cautious in his path towards an orderly deleveraging.